It's interesting to watch the focus of the Christy Freeman story shift without any significant changes in the known facts. This morning's coverage emphasized the fact that a woman was being charged with murder after a late-term stillbirth after attempting a self-abortion. Of course, the papers didn't neglect to inform the public that three other fetuses were found on her property. For example the Washington Post's headline: Mother Charged in Stillborn Death Fetal and Placental Remains of 4 Are Discovered in Ocean City--disturbing, but accurate and dispassionate. "Search of Maryland Property Continues, Infant Remains Tested for Link to Accused Killer Mom", says the latest FOX headline. CNN outdoes FOX: "Police: Remains of 4 babies found at scene of newborn's killing." The word "abortion" has all but dropped out of this afternoon's coverage. It's all about the dramatic murder investigation with the FBI and earth-moving vehicles and cadaver sniffing dogs. A dispassionate discussion of facts and law has been replaced by standard-issue dispatches from the ongoing "grim search" for the "bodies" of "infants." The press has stopped questioning why this is a murder investigation at all. It's only because of a gross misapplication a unworkable anti-choice law that there's a murder investigation underway in the first place. See Bean's post at LGM for more legal details. There is simply no legal basis to charge Freeman with first degree murder for delivering a dead fetus after trying to abort herself. Maryland law exempts women from criminal penalties for self-abortions. Obviously, there should be an investigation if four fetuses are discovered in a private home after a bloody stillbirth. I would suggest starting with social services and then maybe thinking about a criminal investigation after the medical examiner's report. Whereas, according to the Guardian, these prosecutors laid charges before the ME had drawn final conclusions about the recent stillbirth, let alone assessed the gestational age or cause of death of the other remains found. Moving fast to press first degree murder charges was a smart PR move by prosecutors because it guaranteed that the press would shift to spectacular-murder mode. Hey, it's Shark Week on Discovery and we haven't had a fresh Missing White Woman lately. All this sensationalism is making reporters into dupes for the anti-choice movement. The coverage is acclimatizing the public to view abortion as indistinguishable from serial child murder. If you come out and say "I believe that abortion is murder" on television, most viewers peg you as a radical. Whereas, when the news takes that premise for granted, it's just the facts. The afternoon stories don't seem especially concerned about the fact that a woman has been charged with first degree murder for delivering a fetus that everyone agrees was born dead. Hoarding self-aborted fetuses is creepy as all hell, but it's not a crime in Maryland. I'm not dismissing the possibility that other crimes will be discovered in the course of the investigation, but the authorities haven't got nearly the evidence they need to support a charge of first degree murder. A 37-year-old taxi cab company owner from Ocean City, MD has been charged with murder after she sought emergency care for complications of a late-term pregnancy loss. Christy Freeman initially told doctors that she hadn't been pregnant, but later admitted that she had been. Doctors found 8-9 month placenta in her body with a jaggedly-cut umbilical cord. Inside a trunk in the living room, they found the remains of two fetuses in two plastic bags and what appeared to be a placenta in a third bag. In a vanity under the bathroom sink, they discovered a 26-week-old, 2 1/2 -pound stillborn child wrapped in a blood-smeared towel. And in the upper section of a Winnebago parked outside were the remains of a fourth tiny body. Everyone agrees that the fetus was born dead. Yet, Freeman is being charged under the special "fetal murder" law with an exemption for self-induced abortion. By definition, anything she may have done to deliberately kill the fetus would be a self-induced abortion. This case is going to be sensationalized for all the wrong reasons. I think they're throwing the book at this woman because of the "ick" factor. The real outrage is that a woman is being charged with murder for a stillbirth. 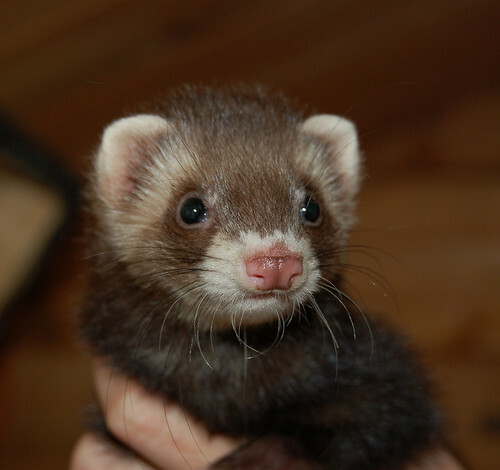 Giuliani accuses Dems of wanting "nanny government"
Ferret, originally uploaded by Thelms Eye. Rudy Giuliani is accusing the Democrats of wanting a nanny government for the United States. Hizzoner even compared legalizing ferrets to legalizing tigers. Someone should ask Giuliani whether he supports his Republican successor's plan to ban unauthorized photo shoots in New York City. The new rules, which were proposed by the Mayor’s Office of Film, Theater and Broadcasting, would require any group of two or more people who want to use a camera in a public place for more than 30 minutes to get a city permit and $1 million in liability insurance. The same requirements would apply to any group of five or more people who plan to use a tripod in a public location for more than 10 minutes, including the time it takes to set up the equipment. The permits would be free. Ironically, Bloomberg is just fine with unlicensed cameras when they are trained on citizens in the name of security and fighting petty crime. Photography is an established form of free speech. We shouldn't have to get permission permission or taking and million-dollar insurance policy in order to exercise our First Amendment rights. It seems clear that this measure is designed discourage small-time filmmakers from shooting in the city. Cynics would speculate that the Mayor's Office of Film, Theater, and Television wants to create a monopoly for the big commercial filmmakers who generate revenue for the city. The rules apply to still photographers as well. There are no exceptions for amateurs. It's not clear whether this ban will apply to journalists as well--nothing I've read suggests otherwise. Are they really saying that every camera crew in the city has to get a permit before it shows up to cover a story? The New York Civil Liberties Association has pledged to sue the city if these unconstitutional restrictions become law. Picture New York is a newly-formed advocacy group fighting the proposed restrictions. You can sign their e-petition here. Update: Here are the proposed regulations in full. Based on my incomplete reading, there is a media exemption, but it applies only to those with pre-approved NYPD press passes. 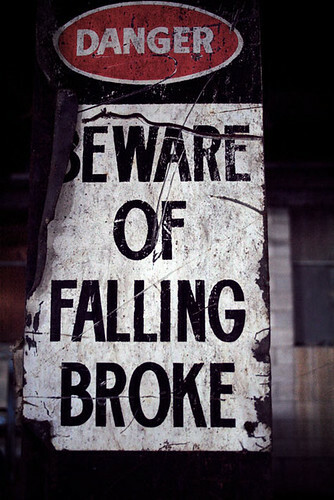 Falling-broke, originally uploaded by Chapple.stephen. Revere spotted this gem of a headline in the Guardian: Insane donor 'rational to give to Tories'. As Revere points out, that's the just standard neo-conservative line. Hoping to hang on to the money, Tory lawyers insist that Zoran Kostic was being perfectly rational when he bequeathed his estate to their party in 1989. He did it because he admired Mrs. Thatcher and loved Britain, they claim. Kostic's disinherited family points out that since 1985, Kostic has "claimed there was an international conspiracy of more than 100 people masterminded by sexually perverted pharmaceutical company executives to destroy "freedom, democracy and human purity"." If the Tories can prove that Kostic was a supporter of said conspiracy, they deserve to keep the money. It should come as no surprise that Bush crony William R. Steiger turned out to be the Eric Keroack of global health. This administration has a longstanding habit of breaking public institutions by handing them over to people who are actively hostile to the institution's core mandate. I just stumbled on an excellent website dedicated to all aspects of Thai food: The Thai Table. I like the site because of the authors' depth of knowledge and clarity of expression. Also, each recipe entry includes realistic-looking photo illustrations that actually show you how the developing dish might look in your kitchen--as opposed to food-styled images that are included more for aesthetics than instruction. I haven't tried any of the recipes yet. The first on my list of items to try is the fried whole fish with tamarind--in addition to looking tasty, this recipe page is a good example of how the authors use photos and prose to demystify recipes that might otherwise seem daunting. Anonymous Liberal, a lawyer and former guest-blogger for Glenn Greenwald, reviewed Alberto Gonzales' entire testimony and summarized the perjury case against the Attorney General.